When Oprah announced to the world that she would be ending her self-titled daytime talk show, my heart crumbled a bit. Yes, I was one of those. I was that woman who devoted an uninterrupted hour of the day to watch Oprah share her views and opinions on various topics. Topics that often left me either clinching a piece of Kleenex in my hand for those "ugly cry" moments or beaming with hope that I may one day appear on her show to hear the words, "you get a car!" But my chances to be in the presence of thee Oprah Winfrey have not completely gone away. 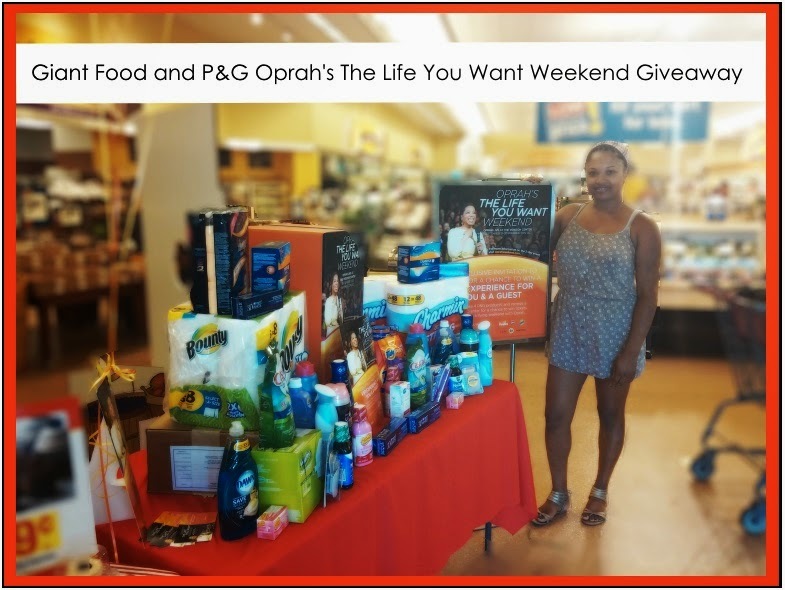 Thanks to Giant Food and P&G (Procter & Gamble), one grand prize winner will win a VIP experience to attend Oprah's The Life You Want Weekend when it hits Washington, D.C from September 19th to September 20th. Oprah’s The Life You Want Weekend: On Friday, September 19th, Oprah takes the stage at the Verizon Center for a profound and moving one-woman show. This is followed by a day-long event on Saturday, where Oprah and her hand-picked “life trail-blazers” will lead a gathering of thousands. In the weeks leading up to Oprah’s show, Giant Food and P&G will support women’s empowerment through donations to local charitable organizations through the 11 Weeks of Empowerment campaign. Purchase 4 P&G products at your local Giant Food store. When your transaction is complete, the cashier will hand you code that prints out. Take this code and enter it on the website. DCLifeYouWantWeekend.com. No Purchase is Necessary. You can also enter by mail. See the Official Rules. 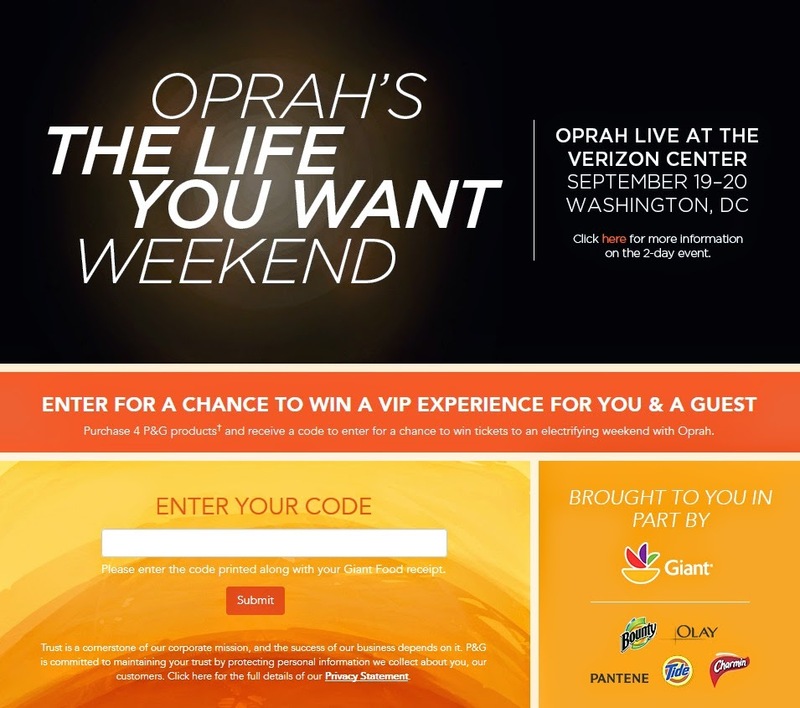 One (1) Grand Prize: Winner will receive “VIP” Admission for winner and one (1) guest to attend the “Oprah’s The Life You Want” Seminar 9/19/14–9/20/14 at the Verizon Center in Washington, DC. “VIP” admission includes: floor seating, a gift bag, an event program and a Meet & Greet with an opportunity to have your photo taken with Oprah. Prize also includes 1-night hotel accommodations in DC (1 room/double occupancy) plus a $100 travel stipend (awarded in the form of a check). ARV $2,600. 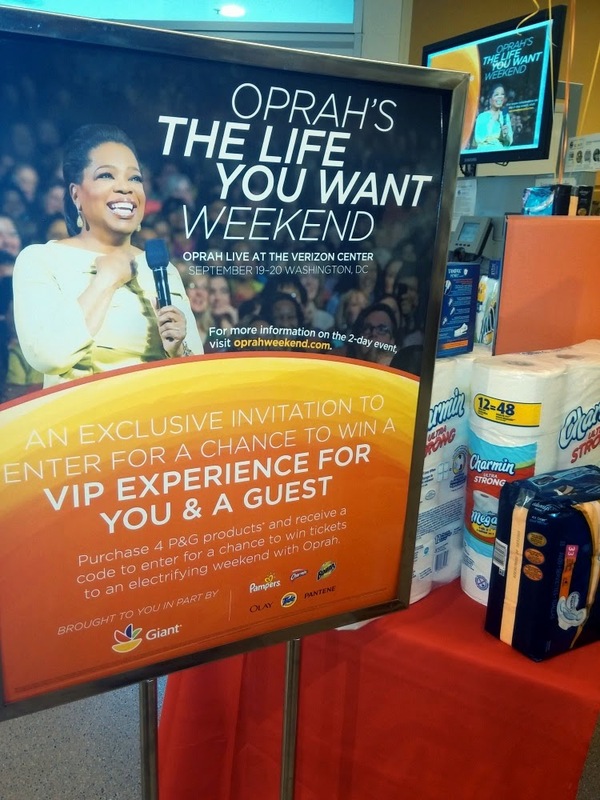 The Meet & Greet with Oprah portion of prize is subject to availability and at discretion of Sponsor. There is no monetary value associated with the Meet & Greet portion of the prize. I feel like my odds are great considering this giveaway is only open to residents of Delaware, Maryland, Virginia and Washington, D.C. I should probably go grab my bucket list and a pencil now so that I can scratch: "Meet Oprah Winfrey" off of it. I have to speak it into existence, right?! I hope you enter as well. Good luck! I was provided a Giant Food gift card to shop for items at the store. There was no monetary compensation for writing this post. The opinions and views are my own.